Posted December 5, 2018 by Josette Farrell in Features. There was stunned silence as news spread of the untimely and unexpected passing of Agnes Lenihan of Claregalway. 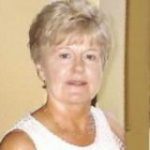 Just over twelve months ago the family and friends gathered to pay respects to her husband tom who lost a long battle with cancer, and the passing of Agnes came as a huge blow to the entire Claregalway community. There are few couples who gave as much service to a community as Tom and Agnes and the loss of both within such a short time has left a huge void. While Tom was frequently playing a front role in organisations, Agnes was quietly working diligently behind the scenes. Providing trojan service to her family, church and community, Agnes was quietly involved in so much of the unknown work of the parish. 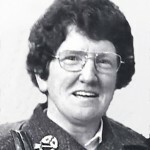 The list of activities where Agnes played a leading role was endless and included the Parish Altar Society, Apostolic Workers, Baptismal Team, Eucharistic Adoration, Envelope Distribution, Hospitality Group, St. Joseph’s Young Priests Society, Sioraiocht and Cairdeas upkeep, Church Gate Collections, Claregalway Tidy Towns, Claregalway Traditional Dancing Club, Claregalway Festival of Drama, Claregalway Historical and Cultural Society, Senior Citizens Committee, SMA Family Day and many more that she assisted over the years. Agnes Lenihan was known as a person who simply did things without fuss and did untold work behind the scenes for many organisations and charities. Her untimely passing has come as a great shock and sadness to her devoted family. She was a great family person and as well as taking wonderful care of her late husband Tom during his long illness, Agnes looked after her children and grandchildren, was the one that kept in touch with her siblings also. It was a tribute to the huge respect in which Agnes was held in the community that people filed past her remains for four hours in Sioraiocht, before her remains were removed to the Church of the Assumption and St. James, Claregalway. The funeral Mass was celebrated by Fr. Ian O’Neill, PP Claregalway who was joined by Fr. Seamus Nohilly, SMA; Fr. Martin Costello SMA; Fr. 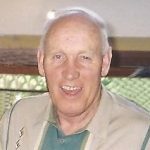 Donal Harney, Knock Shrine, Fr. 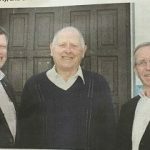 Rob McNamara, Chaplain St. Joseph’s Young Priests Society; Fr.John Naughton, Portumna and Fr. Pat Lynch, Kiltimagh. Agnes was laid to rest beside her husband Tom in Claregalway cemetery. Agnes is survived by her family Michael and Maureen (Boston), Tom and Deirdre (Claregalway), son-in-law Brian (Gaughan), daughter-in-law Sheila Jordan-Lenihan, grandchildren, sisters Sr. Maureen, Theresa, Phil, Kathleen, Bridie, Martina and Ann Marie, brothers Sean and Liam, nephews, nieces, relatives, neighbours and many friends. R.I.P. TOM LENIHAN, Lakeview, Claregalway.